On day 4 of the newest guided meditation app I’m trying (Sam Harris’s ‘Waking Up’), the instructions turned to SOUND – a fascinating line of inquiry, because sound is so easily just part of background environment. So when you isolate it out as an object of attention, it can be reorienting in a really cool and peculiar way (yes, I’m a little nerdy about these things). Meditation teachers often advise one to watch for the source of thoughts… to try see where thoughts are, or seem to be, coming from and where they are, or seem to be, going. In fact basic meditation practice consists of allowing stimuli to arise and fall, come and go, without following it off somewhere or generating stories. This is necessary to develop stability of attention, and to gain the sense that one can opt out of heedless reactions, not be so helplessly triggered. But here, Sam was suggesting to try to ‘get back’ or ‘keep’ the stimuli intentionally. What I found was that, of course, I couldn’t hold on to the sounds, but I would generate a trace memory of the sound that would trick me occasionally, that would seem to be me holding onto the sound. This illustrates something about free will or the absence thereof, but even if one is not into the philosophical question (I am, obviously), the benefit is witnessing first hand, an experience that amounts to trying to hold on to time itself. When you really see yourself trying to do such a thing, you recognize it other places too. So later in the day, a friend shared a little clip of a young girl singing “Halleluiah” beautifully, in really nice acoustical conditions. No matter how many times I hear that song, or who is covering it, I’m always stopped in my tracks. As she finished, I thought about the different versions of the song I’ve heard, and the times I was fortunate enough to see Leonard Cohen himself perform it live. But then I tried to get back that moment. 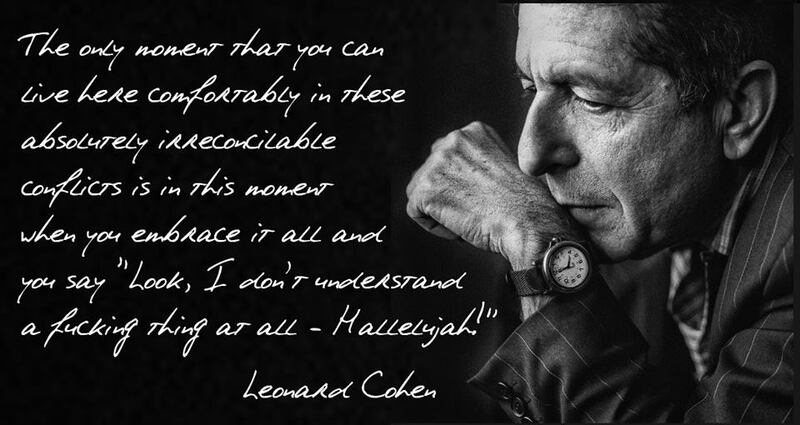 I tried as hard as I could, to bring Leonard Cohen singing live, into my present head space. Frankly, this was shocking. Even if it should be obvious, I realized that I live this way, unexaminedly thinking that experiences I have had can indeed be brought with me. That they are mine to keep in some way, somewhere, that they really belong to me. I do have the memory of those experiences. I can see where I was standing and who I was standing with, what I was wearing. A few moments are vivid, surprisingly musical solos or smiles and jokes, but not even one entire song. This has nothing to do with my level of appreciation in the moment, as I remember it. I think I felt *wow* the whole time. Yet, I could not hold on to that moment. Or, to make the point more clear, I could not hold on to the myself of that moment. I’ll probably continue to think, ‘I’ was actually there.